Surface Pro 3 vs Surface 3: Specs Showdown! 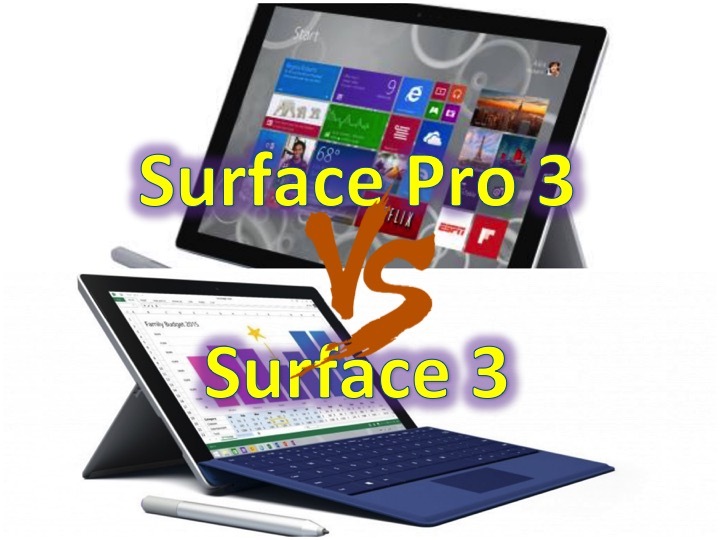 You are at:Home»COLUMN»Surface Pro 3 vs Surface 3: Specs Showdown! The Surface 3 has been released and now available from different outlets; such as Amazon and the Microsoft Store. There are currently two offers running via the Microsoft Store. First, 10% off for students (.edu email required) as well as $150 off by trading in Surface RT or Surface 2 (the maximum is $150 and will depend on the condition of your trade-in). Amazon doesn’t have the same offers running, but if you have Amazon gift cards or an Amazon credit card, you can order it here for $499 (base model). The Surface Pro 3 has been out for almost a year now. While Microsoft is offering the 10% off student discount, retailers like Amazon has it for less (currently at $725 for the base model), and even cheaper for refurbished models (comes with a 1 year Microsoft warranty), 64GB for $669 ($130 off retail, base model $799), the i5/128GB model is $200 off at $799 (regular price, $999), the i5/256GB model is over $300 off at $974.99 (regular price $1299), and the i7/256GB is $330 off at $1149.99 (regular price $1549). If you would like an entry level Surface tablet, the Surface 3 is a great choice. If you need a little more horsepower, I would suggest buying from Microsoft Store if you have the student discount (.edu email required) or one of the many refurbished models from Amazon. There are second hand tablets on eBay; however, lacks the 1 year warranty support. Starting at $799. Price Starting at $499.